Alex Guenette picked up the 1st last-place finish of his NASCAR Camping World Truck Series career in Sunday’s Kroger 250 at the Martinsville Speedway when his #74 Motos Illimitees Chevrolet fell out with a broken oil pump after he completed 32 of the race’s 256 laps. The finish came in Guenette’s second series start. Guenette, a 17-year-old Canadian driver from Terrebonne, Quebec, turned heads with a solid 10th-place showing in the 2013 championship for the NASCAR Canadian Tire Series, including a runner-up finish to Scott Steckly at the Autodrome St. Eustache. 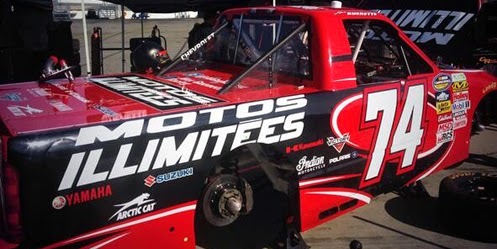 With the Truck Series making its first trip to Canada in last August’s race at the Canadian Tire Motorsport Park, Guenette scored a ride with Rod Sieg’s team. He qualified 14th out of 30 drivers, but ended up 25th with a busted oil line. Martinsville would be Guenette’s next attempt, and his first with his Canadian Tire Series sponsor Motos Illimitees on his Chevrolet. Guenette would this time be driving the #74 entry owned by Mario Gosselin, a Chevrolet with the 2013 body still on the truck. Guenette timed in 26th in the opening session, then improved to 11th-fastest out of 34, five spots ahead of eventual race winner Matt Crafton. Saturday’s qualifying was rained out along with the race, and when Ted Minor withdrew his #12, along with both RSS Racing trucks, the 36 remaining made up the starting lineup. Guenette earned the 24th starting spot. The green flag flew on Sunday afternoon, and Jennifer Jo Cobb’s #10 Dodge was the first to lose a lap on Lap 10. Jo Cobb got her lap back when Norm Benning’s spin brought out the yellow a few laps later. Benning’s #57 Chevrolet held the final spot until Guenette pulled behind the wall on Lap 25. Though he would return to the race to run seven additional laps, fuel pump issues then ended the Canadian’s race for good. Rounding out the Bottom Five were local driver Raymond Terczak, Jr., who spun early in the race, then eventually fell out of his Truck Series debut with brake troubles, and Josh Williams making his 2014 debut in the #66 Southwest Florida Cable Construction Ford. Bryan Silas and Spencer Gallagher were involved in a grinding Lap 122 crash when Gallagher’s #23 Allegiant Air Chevrolet was dumped by Caleb Holman entering Turn 1, sending him into the path of Silas’ #99 Bell Trucks America Chevrolet. *This was the first last-place finish for the #74 in a Truck Series race since this same event in 2012, when Rick Crawford lost the brakes on Harmon’s Chevrolet after six laps. Aric Almirola picked up the 4th last-place finish of his NASCAR Sprint Cup Series career in Sunday’s Auto Club 400 at the Auto Club Speedway of Southern California when his #43 Farmland Ford was involved in a two-car crash that ended his race after he completed 68 of the race’s 206 laps. The finish was Almirola’s first of 2014 and his first in a Cup Series race since Las Vegas on February 28, 2010, 147 races ago. That race, more than four years ago, came while driving for Phoenix Racing when his unsponsored #09 Chevrolet fell out with a vibration after 23 laps. 2014 marks Almirola’s third full season as driver of Richard Petty Motorsports’ iconic #43, a ride he secured following a successful five-race stint in late 2010 driving the #9 Budweiser Ford in place of departing driver Kasey Kahne. In that time, Almirola has scored eleven of his thirteen career top-ten finishes, and has been instrumental in securing the #43 its best sponsorship contract since the old STP days with Smithfield Foods. It’s been a welcome change for RPM, which was created following the closure of Petty Enterprises in 2009, and for Almirola, who lost his ride with DEI following that team’s closure the same season. Since then, Almirola has been inching closer to his first Cup Series victory. In October 2012, Almirola led 69 laps at Kansas and looked poised to score his first Cup Series win before he was taken out in a late-race crash. Then, just last Sunday in Bristol, Almirola battled to a career-best 3rd-place finish, running as high as 2nd before Ricky Stenhouse, Jr. edged him in the final laps. Hopes were high for another good run at Fontana. In California, Almirola put up the 15th-fastest time in the opening session, then timed in 21st in qualifying with a speed of 183.955 mph. No drivers were sent home as just 43 cars showed up to the track following the withdrawals of J.J. Yeley and Dave Blaney. On Saturday, Almirola avoided the tire problems and crashes that affected many of his competitors and timed in 27th in Saturday’s second session, then 25th in Happy Hour. At the start of Sunday’s race, the 43rd spot was held mostly by Ryan Truex, whose #83 Borla Exhaust Toyota trailed the field by a couple seconds during the first green-flag runs. However, with three cautions slowing the action in the first 60 laps without anyone suffering serious damage to their cars, all 43 cars remained running and on the lead lap for most of that time. Travis Kvapil and Joe Nemechek briefly held 43rd as well before Lap 58, when Tony Stewart spun on the backstretch and ended up the first car one lap down. Just a few moments after the Lap 60 restart, however, the caution flew once more. Relief driver Sam Hornish, Jr. in Denny Hamlin’s #11 FedEx Toyota merged in front of traffic off the fourth corner, causing Almirola to lift off the gas. At the same time, rookie Brian Scott was sliding up the track, looking to get in line behind Almirola. The two made contact, sending both Almirola and Scott into the grass. Almirola came out worse in the deal as the nose of his Ford caught the grass, ripping off the sheetmetal. It first appeared that Almirola would return to the track as FOX showed the #43 team put together a new nose for the car. However, the team ended up loading the car on the hauler instead. Almirola, furious with Scott, made his feelings known in an interview. A combination of tire problems and strange mechanical gremlins plagued Sunday’s field, resulting in a unique Bottom Five. Finishing 42nd was Parker Kligerman, victim of a slip into the Turn 4 wall that destroyed his #30 Swan Racing Toyota. 41st was Kasey Kahne, who lost more than 20 laps with mechanical woes that sent his #5 Time Warner Cable Chevrolet to the garage. Greg Biffle ended up 40th, thirteen laps ahead of Kahne, as his #16 3M Aerospace Ford was overheating. And 39th was 7th-place starter Joey Logano, whose backup car broke the rear end following tire problems in practice. *This is the first last-place finish for the #43 in a Cup Series race since Martinsville on April 1, 2007, when Bobby Labonte’s Cheerios / Betty Crocker Dodge finished under power, but 235 laps down to race winner Jimmie Johnson. Labonte was involved in a single-car accident on Lap 39 of the Goody’s Cool Orange 500, the first Martinsville race for NASCAR’s “Car of Tomorrow.” This is thus the first last-place finish for the #43 since the formation of Richard Petty Motorsports in 2009. *The #43 had not finished last in a Cup race due to crash damage since April 17, 2005, when all-time last-place leader Jeff Green and his Cheerios Pillsbury Bake-Off Dodge was involved in a two-car accident with Dave Blaney after 31 laps of the Samsung / Radio Shack 500 at Texas. *The #43 had never before finished last in a Cup Series race at Fontana. However, Almirola finished last in this very event once before, also while driving the #09 Phoenix Racing entry in 2010. *This is only the 30th last-place finish for the #43 in the history of the NASCAR Sprint Cup Series. Ironically, the first two were not scored by Petty Enterprises. The first driver to finish last in the #43 was Larry Mann, who on July 11, 1952 broke a radiator on his 1951 Hudson after 3 laps of a 200-lap race in Morristown, New Jersey (won by Lee Petty). The next was on August 17, 1956, when Louis Headley’s 1956 Plymouth fell out for unknown reasons after the opening lap of another New Jersey race at Old Bridge Stadium. Twelve of the next fourteen were earned by Richard Petty, starting with The King’s first last-place finish at Bowman-Gray Stadium on June 27, 1959, when the transmission let go on his 1957 Oldsmobile after 14 laps, and ending with his 15th and final career last-place finish at North Wilkesboro on October 15, 1989. The other two went to Richard’s brother Maurice, whose 1961 Plymouth ruptured a fuel tank after 16 laps at Concord Speedway on November 5, 1961; and to Jimmy Massey, who crashed the #43 1963 Plymouth on the opening lap of a race at Martinsville on September 22, 1963. Following Petty’s retirement in 1992, the #44 ran in place of the #43 for veteran Rick Wilson. The number then returned in 1994 with Wally Dallenbach, Jr. behind the wheel. An influx of several rookies and new teams that season made it difficult for Dallenbach to qualify for races, and he also brought the #43 its first last-place finish in nearly fifteen years when he lost the engine after 131 laps at Darlington on March 27, 1994. John Andretti replaced Dallenbach, then traded the ride with the late Bobby Hamilton for the next five years. In between, Andretti scored the next five last-place runs for the #43: on October 30, 1994 at Phoenix after 31 laps due to a crash, in the 1999 Daytona 500 after a Lap 25 engine failure, at Martinsville on October 3, 1999 due to crash damage after 291 laps, at the Sonoma Raceway on June 25, 2000 due to a crash after 15 laps, and at Atlanta on October 27, 2002 due to a crash after 4 laps. Between 2002 and last Sunday, three drivers finished last in the #43 a combined five times. Brazilian open-wheel star Christian Fittipaldi’s brief venture into NASCAR was marred by consecutive last-place finishes at Darlington and Richmond in September 2003. Jeff Green’s finish at Texas came two years later, followed in 2006 by an early engine failure for Bobby Labonte after he led 13 laps of the spring race at Atlanta. Following Labonte’s above-mentioned last-place run at Martinsville in 2007, the #43 never finished last until Sunday’s race. The 2000 Sonoma event was to be the final race where STP ran as the #43's primary sponsor before Cheerios took over - but after John Andreti’s crash, the scheme ran once more in the season finale a Atlanta. The scheme has returned for select races ever since, and will again for Almirola’s next race next week at Martinsville. Jeff Green picked up the 56th last-place finish of his NASCAR Nationwide Series career in Saturday’s TreatMyClot.com 300 at the Auto Club Speedway of Southern California when his #91 Hefty Ultimate With Arm & Hammer Toyota fell out with a vibration after he completed 4 of the race’s 150 laps. The finish was Green’s third of the 2014 season and his first since Las Vegas, two races ago. TriStar Motorsports has now finished last in ten consecutive NASCAR Nationwide Series races: seven in car #10 and three in car #91. 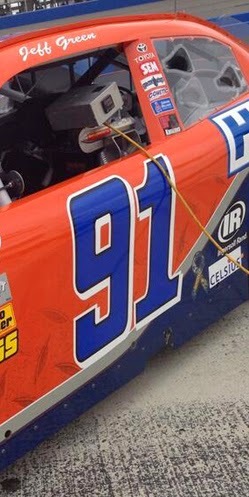 The #91, TriStar’s part-time fifth team, was entered in the race at the Fontana track, giving the team its first start since Daytona, where Green finished last in the season opener. 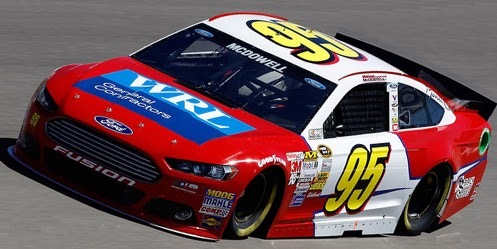 This time, the #91 would carry sponsorship from the same Hefty brand that finances teammate Eric McClure in the #14. Blake Koch, who has twice finished last this year, then moved to the #10. Joining Green, Koch, and McClure in the other two TriStar cars at Fontana were Mike Bliss in the #19 and David Starr in the #44. Jason White and the #00 SR2 Motorsports entry withdrew prior to the event, and after some other rides shuffled, exactly 40 cars showed up to make Fontana’s 40-car field. Green timed in 29th at an average speed of 170.330 mph. This ranked him third of the five TriStar entries behind 18th-place Bliss and 21st-place Starr, but ahead of 32nd-place Koch and 33rd-place McClure. Green didn’t practice in the opening session, but timed in 34th out of 38 in Happy Hour. At the start of the race, as Kyle Busch sliced his way through the field from the 39th starting spot, Green and Koch fell toward the rear. Green pulled behind the wall first, followed two laps later by Koch. One lap after Koch came Carl Long, who fielded a second car for Jimmy Means Racing. Long’s Toyota was the backup car for Means’ driver Joey Gase. Since the #79 was added at the last minute on Friday, the car’s #52 decals were covered with white patches and “79” stickers made of strips of black tape. Rounding out the Bottom Five were Matt DiBenedetto, scoring his fourth consecutive bottom-five finish in The Motorsports Group’s #46, and the lapped #51 RepairableVehicles.com Chevrolet of Jeremy Clements. Mike Bliss was the highest-finishing TriStar car on Saturday, finishing 18th. *This is the first last-place finish for the #91 in a Nationwide Series race at the Auto Club Speedway since February 25, 2008, when Larry Gunselman’s unsponsored Chevrolet fell out with a vibration after 3 laps. 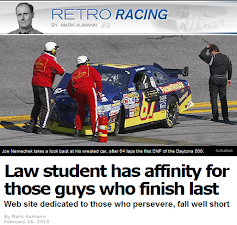 The race was just the second start for MSRP Motorsports, a team that would go on to score the 2009 LASTCAR Nationwide Series Championship with Johnny Chapman and eventually evolve into Phil Parsons Racing, the current #98 team in the Cup Series. *This is Green’s third last-place finish in the previous five Nationwide Series races at Fontana. He trailed the field in the fall of 2010 and the spring of 2012, both while driving for TriStar. Timmy Hill picked up the 1st last-place finish of his NASCAR Sprint Cup Series career in Sunday’s Food City 500 at the Bristol Motor Speedway when his #33 Little Joe’s Autos Chevrolet suffered crash damage that ended his night after he completed 160 of the race’s 503 laps. The finish came in Hill’s 26th series start, and is also his first in any of NASCAR’s top three divisions. After two partial seasons in NASCAR’s top division, the Maryland driver moved from Frank Stoddard’s FAS Lane Racing (#32) to the #33 fielded by Circle Sport. Circle Sport is the same Joe Falk-owned team that, since last year, has helped keep Richard Childress Racing’s part-time fourth team up in the Owner Points by running the remainder of the season. The RCR-Circle Sport alliance continues into this season. 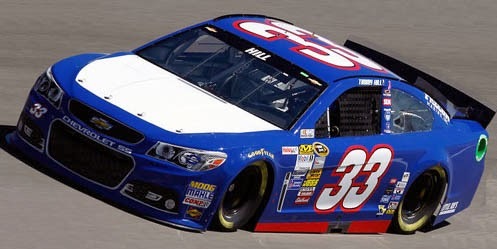 After Brian Scott ran for Childress in the #33 at Daytona and Phoenix, Hill made his 2014 debut last Sunday at Las Vegas, finishing 38th in Joe Falk’s flat blue Chevrolet. Hill had made his Cup debut at the Vegas track two years earlier, finishing 42nd in Rick Ware’s #37 Ford. His best Cup finish came at Kansas last October, where he finished 22nd in Frank Stoddard’s #32. His best Nationwide Series finish in 64 starts are a 7th and 9th in the two Daytona races in 2012. Sunday would be Hill’s first Cup start at Bristol, a track where he’d finished no better than 22nd in three previous Nationwide Series starts. He managed to improve that mark with a 21st-place run in Saturday’s race while driving or R3 Motorsports, but his Cup Series weekend went less smoothly. Hill was just 44th-fastest in the opening session, besting only Justin Allgaier, who failed to complete a lap due to a crash. He had the slowest car in qualifying, putting up a speed of just 122.084 mph, nearly 9 mph off the pace of polesitter Denny Hamlin. He made the field with a provisional, besting David Reutimann in Front Row Motorsports’ #35 and Dave Blaney, now 0-4 in Randy Humphrey’s #77. On Saturday, Hill trailed the second practice session, then improved to just 38th in Happy Hour. At the start of Sunday’s race, four drivers fell to the rear before the green flag, but Hill not only fell to 43rd, but was nearly two seconds behind the next driver around Lap 20. Hill’s car was the first to go a lap down, but the relentless pace of the first 51 laps before the competition caution put him out of contention for the Lucky Dog. After that caution, Hill briefly lost 43rd to Alex Bowman, who lost several laps when the battery on his #23 Dr. Pepper Toyota fell out on the track for Parker Kligerman to his with his #30 Swan Racing entry. Bowman and Kligerman returned to the race. Hill, still struggling with his car, slipped back to 43rd when rain stopped the event after 136 laps. After a three-hour delay, Hill continued to struggle under the lights, often running the high lane to avoid faster traffic. On Lap 167, Danica Patrick and Cole Whitt tangled on the frontstretch, sending Whitt sliding into traffic. Parker Kligerman slowed to avoid hitting his teammate, causing leaders Kurt Busch and Matt Kenseth to do the same. With Jamie McMurray running the low lane, Hill remained up high. Apparently unaware the leaders had stopped, Hill collided with the back of Kenseth’s car, destroying the nose of his Chevrolet while ripping the bumper from Kenseth’s car. Hill spent several laps behind the wall, then returned to complete another thirteen laps around Lap 270 before he pulled out of the race for good. By that point, the race remained a crashfest. Finishing 42nd was Ryan Truex, who cut down a right-front tire on Lap 277 and pounded the backstretch wall. 41st went to Joe Nemechek, the all-time leader in last-place finishes at Bristol, who went behind the wall several times in his NEMCO-JRR #66. Cole Whitt’s battered #26 finished the race under power, but in 40th, 73 laps in arrears. Rounding out the Bottom Five was Kevin Harvick, his second-straight finish of 39th or worse, this time following a grinding Lap 452 crash due to a mechanical failure. *This was the first last-place finish for the #33 at Bristol since 2001, when Joe Nemechek’s Oakwood Homes Chevrolet overheated after he completed 108 laps of the Food City 500 (LINK). The number’s most recent last-place run in Cup came five races ago at Phoenix last fall, when Tony Raines drove a near-identical Chevrolet for Falk. *Hill is only the second first-time Cup Series last-place finisher in the last 48 races, joining Danica Patrick in last fall’s Kansas race. *The 160 laps completed by Hill are the most by a Cup Series last-place finisher at Bristol since 2008, when Sterling Marlin completed 184 laps before crash damage ended his run in the Sharpie 500. That race was also the most recent time a Chevrolet finished last in a Cup Series race at Bristol, prior to Sunday. Blake Koch picked up the 6th last-place finish of his NASCAR Nationwide Series career in Saturday’s Drive to Stop Diabetes 300 at the Bristol Motor Speedway when his #10 SupportMilitary.org Toyota fell out with a vibration after he completed 5 of the race’s 300 laps. The finish was Koch’s second of the season, his first since Phoenix, two races ago. 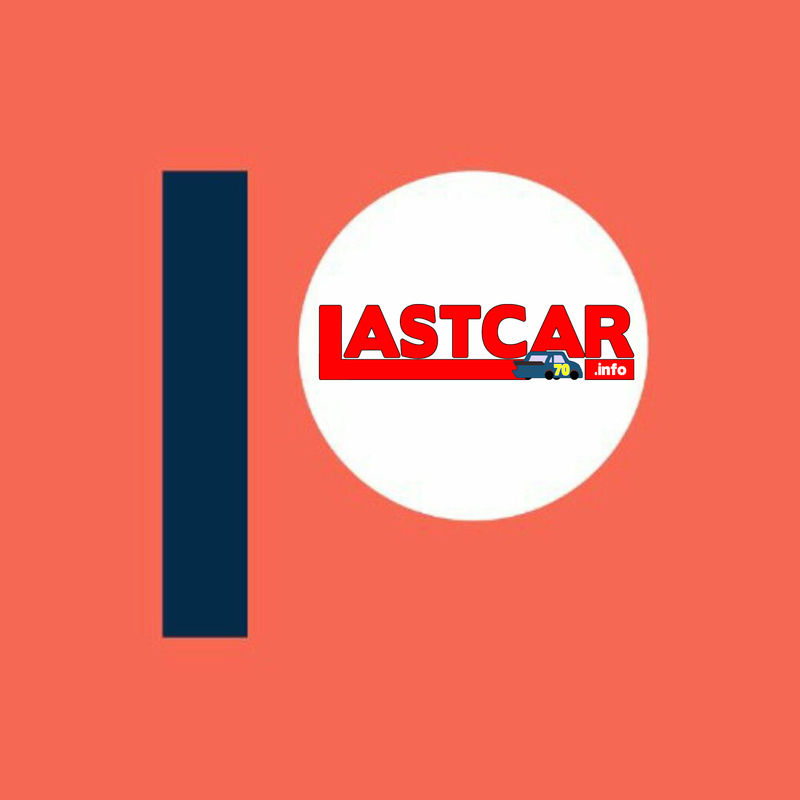 It is the ninth consecutive last-place finish for TriStar Motorsports and the third in a row for the TriStar’s #10 team, which scored the last two LASTCAR Nationwide Series titles with teammate Jeff Green. One week after Green’s last-place run at Las Vegas, Koch took over driving duties in the #10 at Bristol. Koch timed in 34th in the opening practice, then 39th in the second. He improved to put up the 24th-fastest time in qualifying with a lap of 121.898 mph, ranking him third of the twelve “go-or-go-homers” behind Cale Conley and Matt DiBenedetto. Koch’s speed was more than enough to knock Martins Motorsports teammates Tommy Joe Martins and Willie Allen out of the field. At the start of Saturday’s race, DiBenedetto, who timed in 16th, fell to the rear of the field, preparing for an early exit in The Motorsports Group’s #46 Chevrolet. However, Koch still beat DiBenedetto to the garage area by a single lap, preventing TMG from scoring its first last-place finish since Richmond last September. Rounding out the Bottom Five were Carl Long, giving the #93 JGL Racing team its second bottom-five finish in three races, Matt Carter in the first start of the season for Derek White’s #13 Head Rush Clothing Toyota, and Tanner Berryhill in his family-owned #17 bwp Bats Dodge. *Despite TriStar’s streak, this is actually the team’s first last-place finish at Bristol since August 26, 2011, the night Jeff Green became the first NASCAR driver to score four consecutive last-place finishes in the same division. 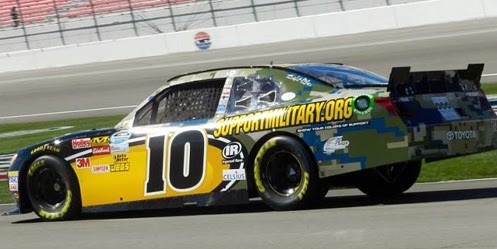 Jeff Green picked up the 55th last-place finish of his NASCAR Nationwide Series career in Saturday’s Boyd Gaming 300 at the Las Vegas Motor Speedway when his #10 SupportMilitary.org Toyota fell out with a vibration after he completed 3 of the race’s 200 laps. The finish was Green’s second of 2014 and his first since the season opener at Daytona, two races ago. TriStar Motorsports extends its last-place streak to eight consecutive races, including all three run so far this year. It is also Green’s 60th last-place finish across all three of NASCAR’s top divisions, a mark reached in just 653 combined starts over 25 years. Curiously, 653 is the number of Cup starts the late J.D. McDuffie made over 28 years when he set his record of 32 Cup Series last-place finishes. After a one-week hiatus where teammate Blake Koch put the #10 in the 39th and final spot at Phoenix, Green returned at Las Vegas, where he was guaranteed a starting spot as one of 40 cars on the entry list. Green timed in 26th in the opening practice, 28th in the second, and in qualifying timed in 32nd at an average speed of 173.371 mph. Green was the third-slowest of the eleven “go-or-go-homers” in the field. Ranked behind him were Tommy Joe Martins and Matt DiBenedetto, who joined Green in the Bottom Five, five laps ahead of him, when all three pulled behind the wall in the early laps. Josh Wise, DiBenedetto’s teammate at The Motorsports Group, fell out after 82 laps, followed after the halfway point by Joey Gase in Jimmy Means’ #52. *This was the first-ever last-place finish for both Green and the #10 in a Nationwide race at Las Vegas. Morgan Shepherd picked up the 18th last-place finish of his NASCAR Sprint Cup Series career in Sunday’s The Profit on CNBC 500 at the Phoenix International Raceway when his #87 SmartBen / Morris Hardwick Schneider Toyota fell out with brake problems after he completed 28 of the race’s 312 laps. The finish was Shepherd’s first since September 9, 2006, 265 races ago, when his #89 Victory In Jesus Dodge had brake problems after 18 laps of the Chevy Rock ‘n Roll 400 at Richmond. 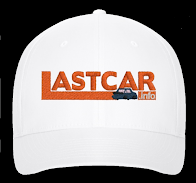 The finish gives Shepherd sole possession of the sixth spot in the all-time LASTCAR Cup Series rankings and ties him with Derrike Cope for third-most in LASTCAR history - 36 apiece. Only Joe Nemechek and Jeff Green have more. 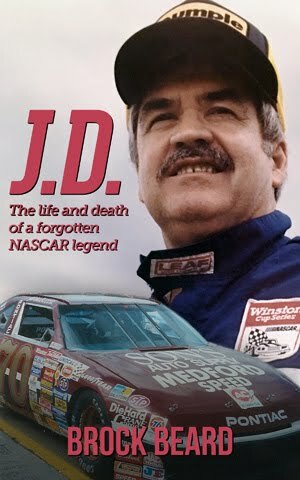 At the age of 72 years, 4 months, 18 days, Shepherd is now the oldest last-place finisher in the history of the NASCAR Cup Series. He beats the previous record of 65 years, 5 months, and 2 days set by Hershel McGriff at Sonoma on May 16, 1993. However, Shepherd is not the oldest last-place finisher in NASCAR history - that record is still held by James Harvey Hylton, who on May 6, 2011 finished last in a Nationwide race at Darlington at the age of 76 years, 8 months, and 10 days. These statistics may also be incomplete as the birth dates of all NASCAR last-place finishers have not been recorded. Shepherd is the 1983 LASTCAR Cup Series Champion and the 2007 LASTCAR Nationwide Series Champion, the only active Cup driver with titles in those two divisions. 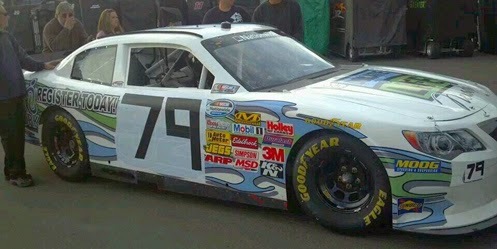 Shepherd’s ride at Phoenix was Nemechek’s familiar #87. 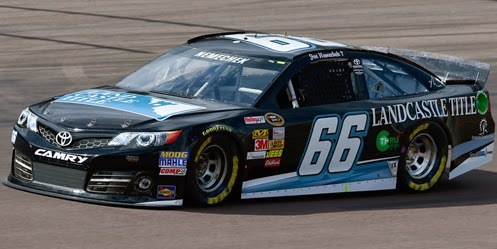 In the offseason, Nemechek agreed to assist Michael Waltrip Racing at keeping the #66 higher up in Owner Points. Waltrip and Jeff Burton would drive the #66 in only a handful of races, so Nemechek would enter his own ride for most of the season, similar to the arrangement between Tommy Baldwin Racing and Stewart-Haas Racing in 2012 that kept Danica Patrick’s #10 in the points. Shepherd and Nemechek were among the five drivers who failed to make last week’s Daytona 500 as both finished a lap down in each Budweiser Duel. Shepherd was attempting to make his first Daytona 500 since 1997 and, in so doing, beat Dave Marcis’ 2002 record as the race’s oldest starter by eleven years. 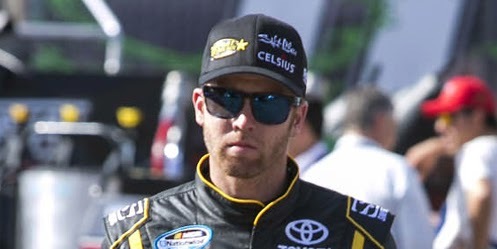 Shepherd already claimed the record for the oldest driver to start a Cup race last July at New Hampshire, where he finished 41st in Bob Keselowski’s #52. In practice at Phoenix, Shepherd was slowest in the first session. Nemechek took the wheel of the #87 in the second session, but trailed that session as well. Despite their struggles in practice, both Shepherd and Nemechek made the field for the race based on Owner Points. Shepherd qualified 42nd for his 516th start at an average speed of 128.995 mph, slowest overall other than Justin Allgaier, whose qualifying wreck prevented him from putting up a timed lap. Nemechek timed in 38th, putting both NEMCO-JRR cars into the field for the first time this season. 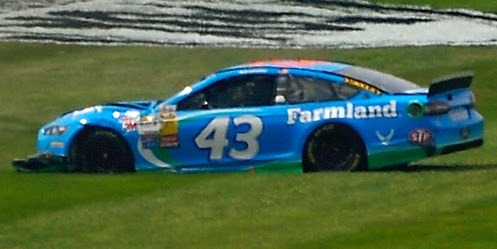 In Sunday’s race, Shepherd’s was the first car to lose a lap. Around Lap 20, he pulled behind the wall for four laps, then ran a few more before he exited the race for good just before the competition caution on Lap 30. Joe Nemechek lost several laps in the early stages as well, but climbed from 42nd to 40th after a series of late mechanical troubles. Parker Kligerman’s #30 Swan Energy Toyota fell off the pace early, then lost the engine after 226 laps. Fellow rookie Alex Bowman struggled with brake problems on the #23 Dr. Pepper Toyota for BK Racing, and Kurt Busch brought out the final caution of the day when his #41 Haas Automationa Chevrolet, already on seven cylinders, lost the engine in a plume of smoke. 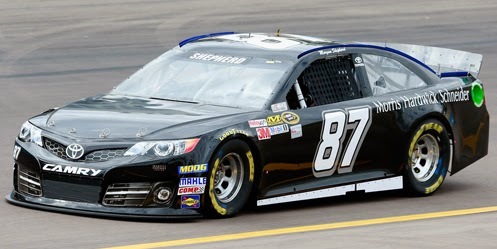 *This was Shepherd’s first last-place finish in a Cup race at Phoenix. *This was the first last-place finish for the #87 in a Cup race at Phoenix since the spring race of 2011, when Joe Nemechek’s unsponsored NEMCO Motorsports Toyota had electrical problems after 22 laps. Blake Koch picked up the 5th last-place finish of his NASCAR Nationwide Series career in Saturday’s Blue Jeans Go Green 200 at the Phoenix International Raceway when his #10 SupportMilitary.org Toyota fell out with a vibration after he completed 3 of the race’s 168 laps. The finish was Koch’s first of the season and his first in a Nationwide race since last fall at Atlanta, eleven races ago. It is also extends TriStar Motorsports’ last-place streak to seven consecutive races, including two in a row at Phoenix. Koch’s 2014 plans were announced six days before the Daytona 500: he would drive Front Row Motorsports’ #35 Ford in the Cup Series at Phoenix and Las Vegas. They would be his first Cup starts since he drove for Leavine Family Racing at Charlotte last October. In addition, Koch was also tabbed as driver of the #10 Nationwide Series entry, the car driven by David Starr at Daytona and for most of the last two seasons by all-time LASTCAR leader Jeff Green. Green and the #91 TriStar entry weren’t at Phoenix, and Will Kimmel ran the #44 Koch drove to a 22nd-place finish at Daytona, so Koch was tabbed for “start-and-park” duty. Koch did not practice in the opening session, then timed in 29th of the 39 entrants in final practice. He then qualified 22nd at an average speed of 129.478 mph, ranking him third among the ten “go-or-go-homers” who attempted the race, trailing only Kevin Harvick and Chris Buescher. However, just after the start of the race, Koch pulled behind the wall. Finishing next-to-last was Matt DiBenedetto, who brought back The Motorsports Group’s “start-and-park” #46 and missed the final spot by three laps. Rounding out the Bottom I’ve were Carl Long in the second JGL Racing Dodge, Daryl Harr, whose JD Motorsports Chevrolet was wrecked by Brad Keselowski on Lap 21, and Tommy Joe Martins, making his Nationwide debut in his family’s #76. Koch made the field for the Cup Series race and finished 37th. *This was Koch’s first last-place finish in a Nationwide race at Phoenix.